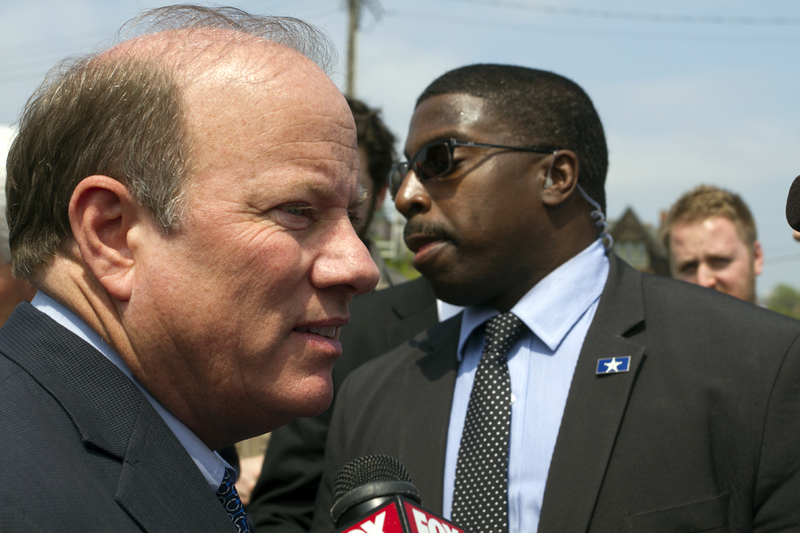 Mayor Mike Duggan has built a formidable political fundraising machine unlike anything Detroit has ever seen. The first-term mayor raised a whopping $2.8 million for his re-election bid, courting big banks, suburban developers, corporate executives, political action committees and other deep-pocket movers-and-shakers, many of whom have contracts with the city or bought Detroit-owned property in the past three years. By comparison, his challengers raised a mere $44,300 combined, giving Duggan a significant money advantage going into Tuesday’s primary election. But the mayor’s fundraising prowess raises serious questions about his influence with outsiders who don’t always have Detroit neighborhoods’ best interests at heart or who have contributed heavily to Republican candidates, including Donald Trump, Gov. Rick Snyder and the Michigan Republican Party. Just 10% of the mayor’s donations came from inside Detroit. Of those, nearly half came from political action committees. Twelve of Duggan’s 26 fundraisers were held outside of Detroit, including two in New York City, three in Bloomfield Hills, one in Grand Rapids and one in Lansing. Duggan’s most successful fundraiser was held at the sprawling home of Yousif and Mara Ghafari, both of whom have histories of donating tens of thousands of dollars to the Michigan Republican Party and conservative candidates, including Donald Trump, Gov. Snyder, George W. Bush and Mitt Romney. An unusual number of employees from deep-pocket companies contributed to Duggan’s campaign, including more than 150 from Blue Cross Blue Shield, 119 from the law firm of former Detroit Mayor Dennis Archer, 30 from DTE and 43 attorneys from Honigman Miller Schwartz and Cohn. Two Blue Cross employees said they felt pressured to donate. Miller Canfield Paddock and Stone, the law firm representing the mayor’s controversial demolition program, which is under a federal grand jury investigation, donated $26,600. The firm’s PAC also donated $10,000 in October 2016. Duggan relied heavily on suburban billionaires and their companies, including Dan Gilbert’s Quicken Loans, Roger Penske and his businesses, the conservative DeVos and Meijer families and Tony Soave, who gave former Mayor Kwame Kilpatrick’s friend, Bobby Ferguson, $30 million in work from 2002 and 2008 and spent an additional $300,000 on Kilpatrick for private flights, hotels, watches and sporting events. Two high-ranking Snyder employees – senior adviser Richard Baird and former Chief of Staff Dennis Muchmore – both donated to Duggan and were influential in the financial takeovers of primarily black cities. Since Duggan became mayor in January 2014, he raised an additional $433,000 through his controversial nonprofit, Detroit Progress Fund, which can take unlimited contributions. A vast majority of the donors are corporations, many of which have contracts with the city. Sen. Coleman Young II. Photo by Steve Neavling. 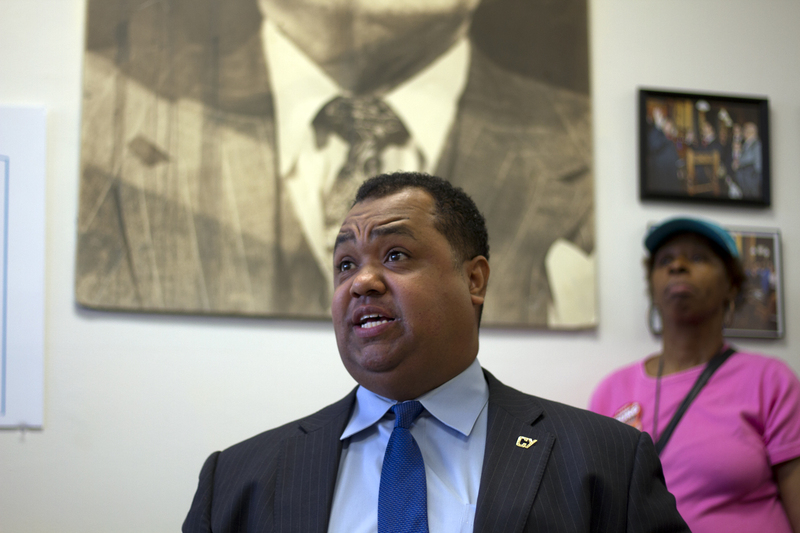 Duggan’s most competitive challenger, Sen. Coleman Young II, who raised $22,000 so far, criticized the mayor for relying on big banks and corporate outsiders who have preyed on the neighborhoods. While Duggan is leading Young in recent polls, serious questions have been raised about the mayor’s loyalty to neighborhoods, where most of the city’s predominately black population lives. Duggan, for example, is demolishing thousands of houses with federal money originally intended to help people save their homes. The mayor also repeatedly lied to the public about the use of $34.5 million in captured taxes to convince billionaire Tom Gores to move the Pistons to downtown Detroit. He also struck deals with the billionaire Illitch family and Dan Gilbert, allowing them to skirt affordable housing requirements for big residential developments in downtown and the rapidly gentrifying Cass Corridor. Among the biggest contributors to Duggan’s campaign was Blue Cross Blue Shield, which has lucrative contracts with the city. More than 150 employees and executives donated nearly $70,000 in the past several months, and the insurance company’s Lansing-based PAC contributed more than $75,000 to Duggan’s campaign and his Detroit Progress Fund. Blue Cross CEO Dan Loepp urged more than 1,000 employees to donate to Duggan’s campaign in March, potentially violating the company’s own code of business conduct, Crain’s Detroit Business reported. A day later, members of the company’s PAC received an email from Duggan’s campaign asking for money. Two Blue Cross employees, who spoke on condition of anonymity for fear of losing their jobs, told Motor City Muckraker they felt pressured to donate. “If you want to climb up the ladder, you do what the CEO wants,” one employee said. Duggan’s most successful fundraiser – in which $277,000 was donated – was held on June 19 at the sprawling Bloomfield Hills home of Yousif and Mara Ghafari, who are deep-pocket donors to Republican candidates. 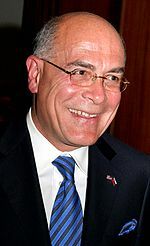 Yousif Ghafari, the former U.S. ambassador to Slovenia, also sits on the Blue Cross Blue Shield Board of Directors. The Ghafari family owns Ghafari Associates, which opened an office in downtown Detroit earlier this year. Wayne Count successfully sued the Dearborn-based company for its role in the failed jail project. Duggan received 56 donations exceeding $1,000 from out-of-state residents, including six executives from JPMorgan Chase, which reached a $55 million settlement with the government in January over allegations that it discriminated against thousands of black and Latino mortgage borrowers. Many of the out-of-state donations came during two fundraisers in New York City. Duggan raised $31,519 on the 20th floor of 277 Park Avenue, where JP Morgan Chase’s world headquarters are. Duggan raised an additional $15,150 at a $1,000-a-plate fundraiser at Shinola’s flagship store in the Tribeca neighborhood of Manhattan. Another company that profits off of foreclosures, Ohio-based Safeguard Properties, also donated to Duggan’s campaign. Founder and chairman Robert Klein and his wife Ita Klein each contributed the maximum $6,800. The company clears out bank-foreclosed homes. More than two dozen executives with Detroit-based Quicken Loans, which the federal government also accused of predatory lending, contributed nearly $73,000 to Duggan’s re-election campaign. In early July, a federal judge ruled that Quicken Loans officers brokered illegal loans in excess of fair market value by relying on excessive home appraisals. Former Detroit Mayor Dennis Archer and his son Dennis Archer Jr. turned out big for Duggan. 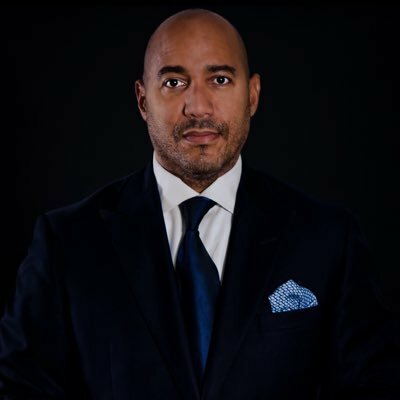 Archer Jr., who won at least two competitive land contracts from the Duggan administration, was a guest speaker at the Shinola fundraiser in New York City. 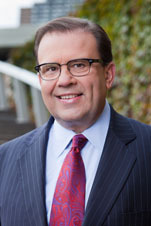 He and his company, Ignition Media Group, donated $14,000 to Duggan’s Detroit Progress Fund. Archer’s father held a fundraiser for Duggan at the former mayor’s home in Palmer Park, where 29 guests donated a combined $49,240. Archer’s law firm, Dickinson Wright, also held a fundraiser at the company’s office in downtown Detroit, raising $10,850. A total of 115 employees of Dickinson Wright donated to Duggan’s campaign. On Monday, Motor City Muckraker explores how Duggan spent his donations and ran his campaign.